God knows the decade of the 1970s was a legendarily tough time for clothing fashions and hair styles. Bird wings masquerading as collars, lapels big enough to be useful in pyramid planning, pant legs the size of craters, fabrics and patterns the likes and use of which no one should have been subject to in the first place (velour pants, anyone? ), not to mention some damn awful haircuts that thankfully saw some improvement as the decade continued. Even Sarah Jane Smith, that space-traveling clotheshorse and companion to a certain Galifreyan Time Lord wasn't immune -- no matter how many light years or millennia away she was from the offending fashion and hairstyle influences. Thankfully, what started out as hot-poker-in-the-eye painful in both areas improved tremendously throughout her travels to the far reaches of the galaxies... which is very evident in the screen caps collected over the months I've totally over-analyzed the character of Sarah Jane in general and her appearance in particular, noting with almost obsessive great attention the ups and downs she weathered. One of the more puzzling observations I've made is the irony of Sarah Jane looking younger after three years of being hypnotized over and over and over; thrown into dark, stinky, scary pits; replaced by an android; blinded; and found herself the object of a giant robot's affections... the list is almost endless. But somehow she pulled it off -- and, in the process, went from fashion boring to fashion funky, culminating triumphantly in possibly the best. outfit. ever. seen. on. television. Well... one of the best. outfits. ever. seen. on. television. I'm very, very, VERY partial to her UNIT cammies more than anything, but Andy Pandy comes in a close second because of its utter and adorable wackiness and total latter-day Sarah Jane-ness. What was initially intended to be a single piece broadly outlining different visual aspects of my absolute favorite companion has developed into a much more involved multi-part project. 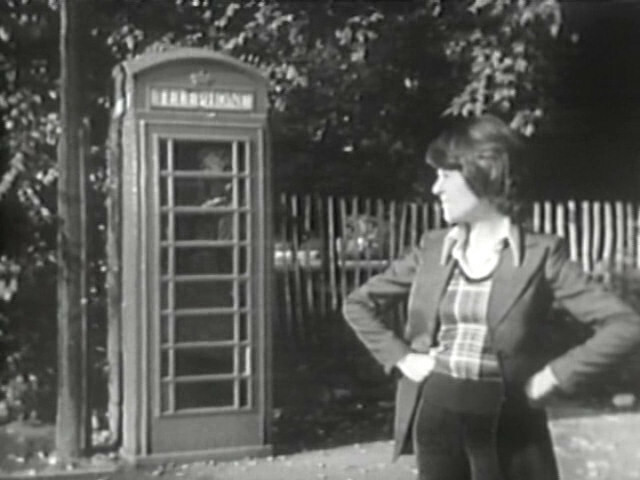 In this first article, the focus will be on Sarah Jane's fashion during her adventures with the third Doctor. 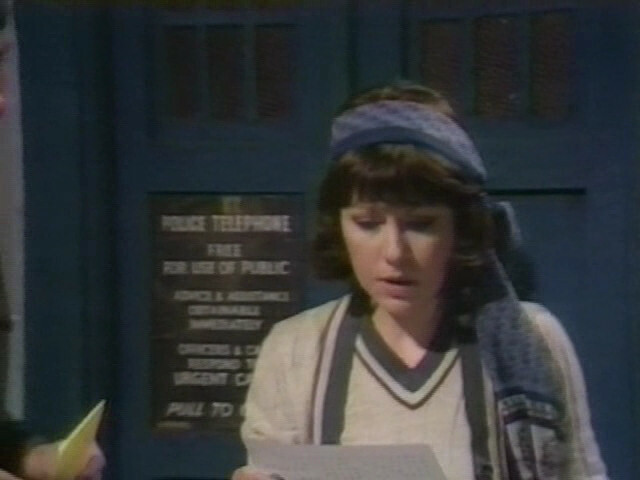 Subsequent installments will provide examinations of clothing trends while traveling with the fourth Doctor, hair styles and their amazing improvement through the years, and, of course, Sarah Jane's penchant for fun footwear, including striped socks and the beloved knee-high leather boots. Some may think I'm totally, totally dissing Sarah Jane (or out of my flippin' gourd), but nothing could be further from the truth. I adore her... absolutely and without question. This series of articles is simply an outgrowth of that adoration, even if it was a tough road to travel that first Sarah Jane season. 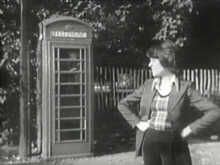 I might as well start at the beginning, when Sarah Jane meets the Doctor and subsequently stows away in the TARDIS. In "The Time Warrior", Sarah's outfit is pretty conservative -- nearly to the point of putting me to sleep. There's absolutely nothing exciting or funky about it; brown is not, nor will it ever be, exciting or funky. Brown is dull, dull, dull. Dull. But by analyzing the tops piece by piece, at least I got a good giggle out of the horror of it, not to mention a strong sense of thankfulness that I was far too young to be subjected to this type of fashion outrage in 1973. 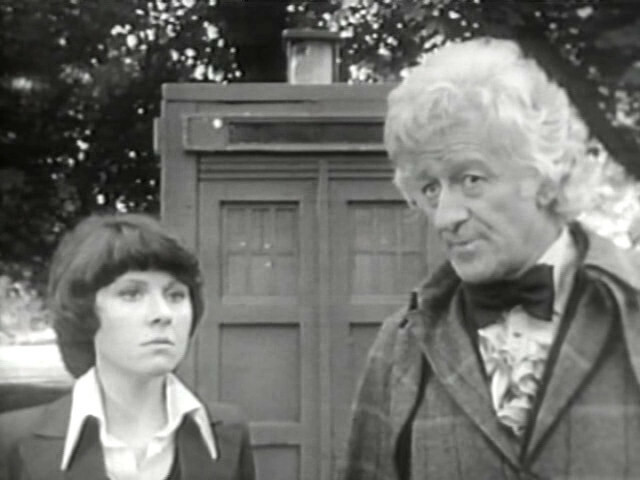 I'm pretty confident it's not the insane situation Sarah's found herself in -- time traveling in a blue police box with an older man -- nor the Sontaran, nor the two men in the room that has caused the "WTF I'm going to start screaming any minute" look on poor Sarah Jane's face. Honestly? If the shirt I were wearing had a collar that was almost the height of my neck, I'd definitely look just as agitated. It would always be there... tickling and annoying. I'd also be worried about visual proof of such a clothing choice surfacing someday and the ridicule that would naturally go hand in hand with it, regardless of the fact this was the look of the time. Despite the fact that I almost can't get past the absurdity of the collar, I like the sweater. Or is it a vest? For God's sake, I hope it's a vest because I would think wearing a sweater and a blouse underneath a jacket could seriously hinder any type of useful and defensive arm movement at all, which would make it difficult to do anything. Except scream. And shriek. A lot, which our Sarah Jane certainly did her fair share of even when her clothing no longer appeared to be so restrictive. Still, I like what I can see of the pattern, but make no mistake: I would never in a million years be caught wearing such a thing because brown's never on my short list of top clothing colors. I sometimes wonder why it would be on anyone's short list, to be honest. And those jacket lapels... for crying out loud, they're as wide as she is. Come to think of it, if that shirt collar were flat, it very well might be wider than she is. 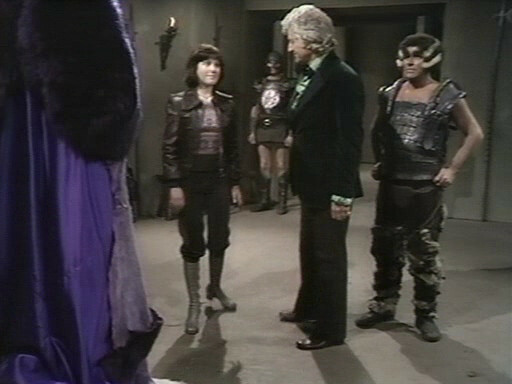 I bet it would have been easy for Sarah to have flown away from that nasty old Sontaran and his two human cohorts! The collar and the lapels are nothing if not the wings of some poor bird that smacked into the TARDIS somewhere along the way. 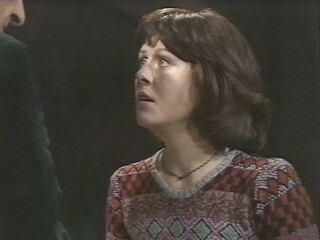 Good for you, Sarah Jane, for letting not the bird's death be in vain! 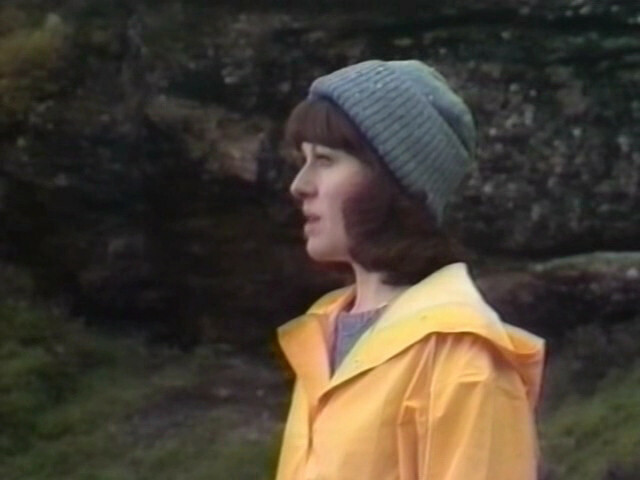 Next up is "Invasion of the Dinosaurs", though there's absolutely nothing I can add because Sarah Jane's wearing the exact same outfit from "The Time Warrior." However, I would like to pose a question: are those pants velvet? Possibly velour? Dear sweet Jesus H. Christ on a cell phone, that's rather odd. It's difficult to tell, but I'm going with velvet for the win here, folks. ...but the real disaster is yet to occur. I'm sure you know exactly where this is leading, don't you? That's right: here, Sarah Jane is sporting a brown jacket and skirt number with a turquoise bathing suit underneath, adding a frivolous bit of color to fun up the absolute dreariness of the brown. Well, despite my strong aversion to this color combination, if that turquoise fun weren't there, this would be another snoozer of an outfit. 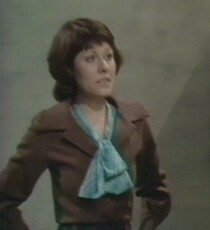 Poor Sarah Jane, clotheshorse that she is... to be saddled with such a sense of fashion. 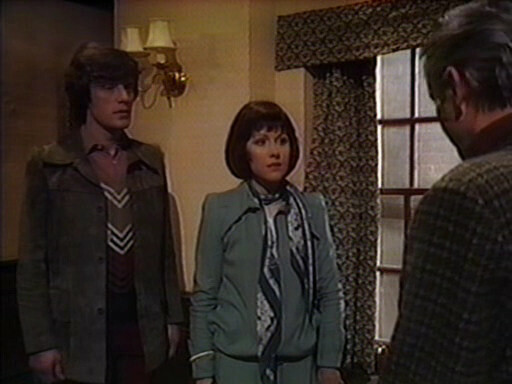 And if I didn't know better and couldn't see those buttons on the left-hand side of the jacket and the slight difference in the cut of the lapels, I would swear this was the same jacket Sarah Jane's been wearing since she joined the Doctor. It also looks a bit roomier than the previous jacket, but then again, a bathing suit would certainly afford a bit more breathing room than a blouse and sweater... vest... sweater-vest...? 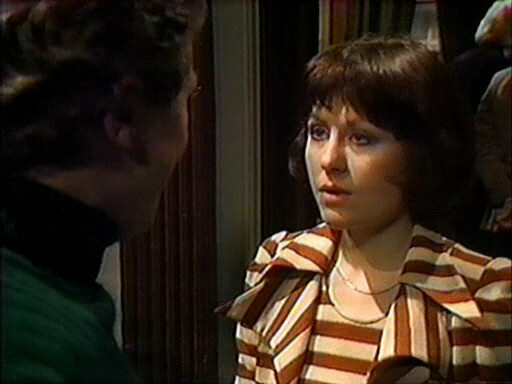 In "The Monster of Peladon", we see Sarah Jane making an admirable and rebellious attempt to break out of her fashion rut. There's definitely more color in the outfit as a whole -- thank God. There's even some boot action to be seen. The boots are grey, but you have to crawl before you can walk, right? Sarah's also sporting a great leather jacket. 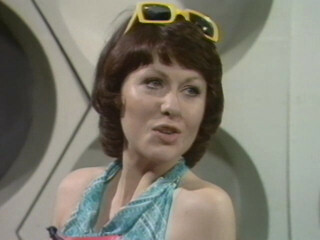 (She wore one briefly in "Invasion of the Dinosaurs" as well, but I guess it was just too stylish for her at the time.) 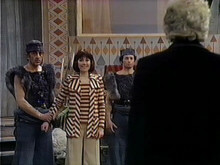 The jacket comes and goes in this episode, and only when it's been shed can the wondrous, geometrical, and very, very 1970s sweater pattern be fully admired for all of its intricacies. The contoured look to the shoulders definitely dates the sweater as strongly as the pattern: that cut screams out 1970s just as loudly as shoulder pads do Joan Crawford and "Dynasty". 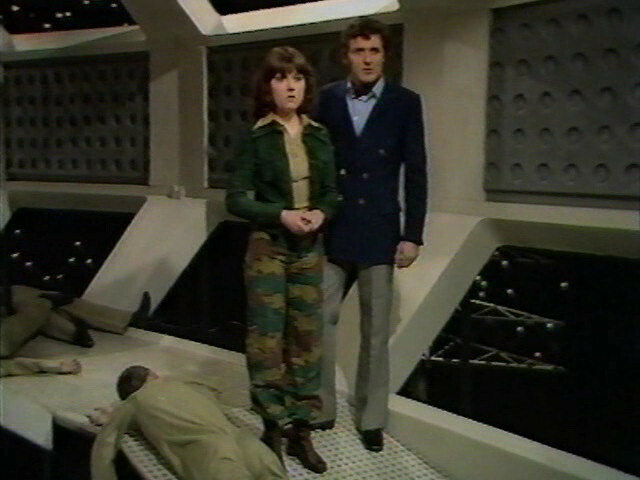 Back to the grey boots for a moment, as they tie into the ensemble: despite their odd color, they do work quite well because of the amount of grey in the sweater Sarah Jane's wearing. If it had been up to me, I might have gone with an oxblood leather instead of the metallic grey, but such a dark color would have been difficult to discern against her pants -- and therefore, that much more difficult to appreciate. Dowdy. Dowdy immediately pops into my head when I look at the first picture because of that scarf. It doesn't add a thing to the outfit, but it does make Sarah look older. I don't mean that in a good way, either; this is just one example of how she appeared older in the beginning. Yes, the scarf matches the outfit quite smartly, but why tie it so sloppily? I don't understand the inclusion of it; it almost looks like an afterthought on someone's part -- a pretty poor one, at that. And I'd so hoped we wouldn't be subjected to the collars and lapels again, but they've both made a most horrifying reappearance in this serial. Since the sheer awfulness of them has already been remarked upon, there's no need for further discussion. Thank God, because I don't think I could endure such an exercise again. The red and khaki striped number in the second picture just plain makes me dizzy. It's no wonder Sarah's been apprehended: there's simply no way she could have evaded notice for long because she looks like a very proud refugee from an interstellar chain gang. Oh, to see the cross-eyed look the Doctor must have on his face from staring at those crazy stripes! It's no wonder this was the episode in which he regenerated. Forget the Great One and the blue crystal draining his power on Metebilis 3: you and I both know it was the stripes what did that poor man in... the same way they ate and absorbed the lapels that would likely dominate the outfit in their absence. Maybe it was the traumatic influence of this particular ensemble that led the fourth Doctor to choose his striped scarf?! Finally, why would anyone take an oversized collar and put another one with it? Double the audience pain -- please. The odd inclusion of the scarf in the first picture is replaced here by the odd inclusion of... a corsage? What the hell? 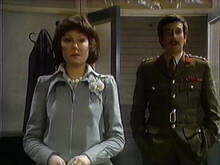 Is the Brigadier taking her to the prom? That's a pretty crappy prom corsage, if that's what's really going on. 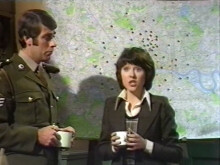 I bet that's why Sarah looks pissed and the Brigadier somewhat apologetic. Well, it's clear who's not getting lucky after prom, isn't it? Seriously, I'm not too sure about the corsage, but whatever. 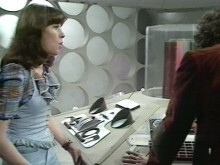 My head's starting to hurt thinking about why Sarah Jane might be wearing it. The next installment (which is now available for your reading and viewing pleasure -- click here to check it out!) will address Sarah Jane's first five adventures with the fourth Doctor, from "Robot" to "Revenge of the Cybermen". These are the serials in which Sarah begins discovering her sense of fashion and builds a strong foundation for all future funkiness -- although even then there are times when she falters. You've come this far, so why stop now? 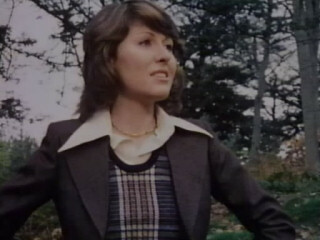 Continue on to the next installments of Sarah Jane Smith Fashionista Fever!